With me still recovering from a week away at Rollercon, and also trying to enjoy the lovely summer we’re having here, this week’s article has turned itself into a lazy-man’s blog post. A pot pourri, a grab bag, a jambalaya if you will, of completely random collected wisdoms. If you want to get better at pushups, you should do more pushups. “Blocking is a lateral game, jamming is a forward game.” – Jackie Daniels. Translation: blockers, stand still (oops, I mean, wheels rolling ever so slightly forward…). Jammers, stop zigzagging around behind walls and just push forward. An actual hospital medical professional told me they pop blisters, and use regular crazy glue to seal the hole after it’s drained. Then they put a “hydrocolloidal” bandage on for a few days. Everyone says ‘keep it dry’. One AWESOME fan wrote me to advise this: run a needle and thread through your blister (2 holes). Remove the needle, leave the thread, and let it drain overnight. Remove the thread in the morning. SO GROSS but also cool. I will try this next time!! A couple of people suggested putting a piece of latex condom over your blister. This also sounds weird and worth trying just to say you did. I went to the world’s cheesiest buffet on Fremont Street with skaters from Gotham at Rollercon. Suzy Hotrod really likes softserve ice cream and all the Gotham ladies are super-nice chill people. Excellent rationale for sports and exercise: your lifetime risk for general dementia is literally cut in half if you participate in leisure-time physical activity. 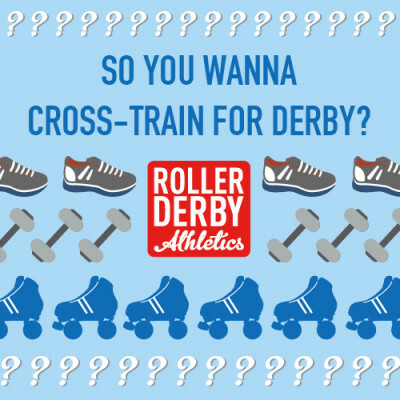 How to win roller derby bouts: Stay out of the box. IT’S THAT SIMPLE FOLKS!! Don’t stretch before skating. Seriously. Just warm up, dynamically. Stretch AFTER you work out. I call the post-skate stretch “flexibility training” because it seems more worthwhile than just “stretching”. More here. DEFINITELY don’t do the “goalie stretch” aka “stripper stretch” (deep groin stretch on the floor with your legs in a froggy position) before skating. 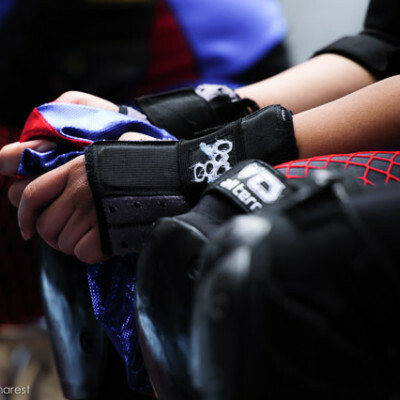 The best way to get better at roller derby is to attend more roller derby practices. If you can’t do a deep squat, it’s not because you aren’t flexible enough. It’s because you aren’t strong enough. Work on it and stop making silly excuses. You’ll be better for it. Pinot Noir, chilled, in the summer is quite a surprising delight. You should try it. The best foot-ankle-balance exercise is to stand on one foot with your eyes closed for 30-60 seconds. If you want more, here’s a whole workout program for your ankles. The best way to improve your cardio and endurance is with interval training. In other words, you have to work hard, but you don’t have to work long. (That’s what SHE said…). If you have a recurrent injury or nagging pain or ‘I just can’t seem to do X without injuring Y,’ then you should really go see a physiotherapist and get some exercises to correct whatever is going on, and/or visit a chiropractor, acupuncturist, or massage therapist to solve the injury. A little kale goes a long way in a smoothie. What’s your favourite derby advice nugget? Post in the comments below!